Tests Administered: Wechsler Adult Intelligence Scale; Bender-Gestalt; Draw-A-Person Test; Rorschach; Thematic Apperception Test; Sentence Completion Test. A copy of the entire testing report is attached. In summary, the patient is currently functioning in a high average range of intelligence overall with a full scale W.A.I.S. IQ of 113. The graphomotor tasks did not indicate organic interference signs. The projective material indicated adjustment problems relating to the expression and integration of anger as well as to the establishment of a viable psychosexual identity. There was a low sense of self-esteem and a sense of frustration and deprivation. While he had some phobic and referential responses in the SCT and Rorschach, these were not prominent or significant. The diagnostic impression was that of an adjustment reaction of adolescence with anti-social trends. The anti-social trends on reviewing the entire psychological report were not dominant in the testing. 1. This patient does not have epilepsy, nor does he evidence any organic brain defects. 2. The patient does not manifest significant referential or paranoid behavior patterns. There is no evidence of any malignant sociopathic trends. 3. I could not document after repeated interviews, including a sodium amytal interview, that Thomas Skakel was responsible for the death of Martha Moxley . 4. 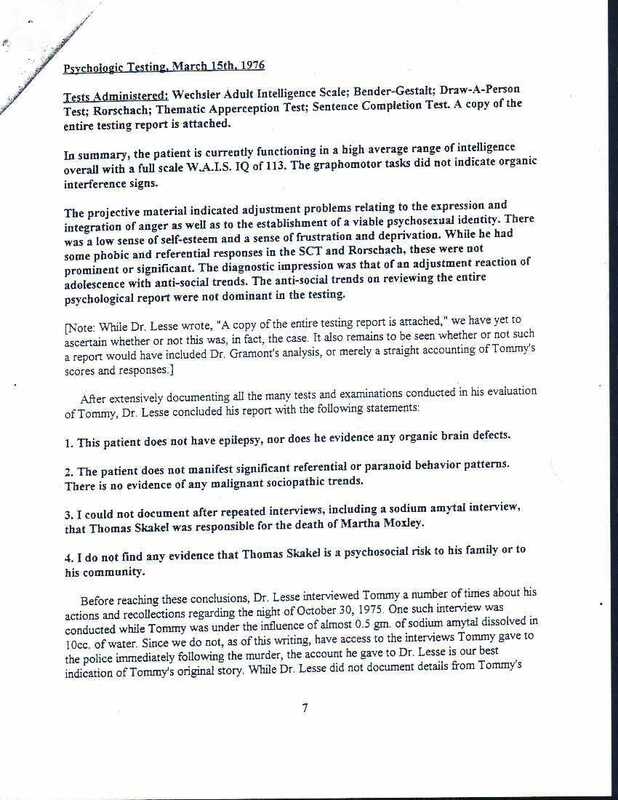 I do not find any evidence that Thomas Skakel is a psychosocial risk to his family or to his community.